Randall Mario Poffo (November 15, 1952 – May 20, 2011), better known by his ring name "Macho Man" Randy Savage, was an American professional wrestler and actor best known for his time with the World Wrestling Federation (WWF) and World Championship Wrestling (WCW). He also had a short run with Total Nonstop Action Wrestling (TNA). Savage held twenty championships during his professional wrestling career and is a seven-time world champion: a two-time WWF Champion, four-time WCW World Heavyweight Champion, and one-time USWA Unified World Heavyweight Champion. Also a one-time WWF Intercontinental Champion, WWE has named Savage the greatest Intercontinental champion of all time and credited him for bringing "a higher level of credibility to the title through his amazing in-ring performances." Aside from championships, Savage is the 1987 WWF King of the Ring and the 1995 WCW World War 3 winner. For much of his tenures in the WWF and WCW, he was managed by his real life wife, "Miss Elizabeth" Hulette. Savage was recognizable by wrestling fans for his distinctively deep and raspy voice, his ring attire (often comprising sunglasses, a bandana or head band, flashy robes, and a cowboy hat), intensity exhibited in and out of the ring, and his signature catch phrase ("Ooh yeah!"). 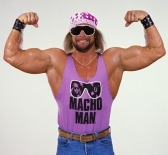 The WWE has said of Savage, "There has never been a Superstar more colorful than 'Macho Man' Randy Savage. His style—perfectly punctuated by his entrance music, 'Pomp and Circumstance'—has only been outshined by his performance in the ring." On 20 May 2011, Savage was killed in a car accident in Seminole, Florida.